SEO tools are a dime a dozen with new ones launching all the time, but a tool is only as good as the person using it. Just in the last week I have learned about new rank tracking, crawling, and reporting software that all claim to make your life easier. But when I’ve gotten under the hood of these tools, they just provide the same service as the existing and dominant tools on the market just with a prettier CSS file. Because of this and the frequent questions I get about what tools to use as a consultant, I want to open up to all of you and tell you exactly the tools I use that make my life as a professional SEO and digital marketer easier. I don’t use a million of them, but the ones I use I get my money’s worth. SEMrush is, hands down, my favorite SEO tool right now. I think I severely underestimated the amazing power of this tool for way too long. It’s incredible for keyword research (especially competitor keyword research! ), keyword tracking, competitor analysis, and historical data to reverse engineer competitor strategies. It’s hard to even write this description because it’s so useful for so many things. If you want a great idea of what’s possible, SEER Interactive has you covered. It starts at $99 a month and goes up from there. I happily pay this subscription each month. If you’re in the SEO space, you know Moz. From their active blog to their well-loved MozCon conference, Moz is a leader in the digital marketing space. Their main app, Moz Pro, allows you to set up campaigns to track keywords and crawl data against your competitors weekly. You also get access to other tools in their toolbox like Keyword Explorer, which is quickly becoming a go-to tool for many digital marketers for keyword research as Google continues to tighten the net on free keyword data. In my consulting work, I have to do a lot of technical analyzing of websites. Because of current level of clients I do not need as robust of a tool as DeepCrawl or Botify (though those are amazing for big accounts with big budgets). Therefore I use ScreamingFrog’s SEO Spider and newly their Log File Analyser (written with an S because they are British :-)). After leaving my last job where I had an enterprise-level budget and we used Splunk to plumb log file data, I have felt at times that I was flying blind when doing technical SEO because I had very little idea what the search engines were actually finding and where would make the biggest difference. The Log File Analyser solves that problem for SMBs and anyone without an agency or enterprise budget. Each is available for a £99 (~$149) annual license. They’re well worth the money. For a long time I resisted getting AHREFs because I already had SEMrush in my toolkit. Eventually I was convinced to try it, and I must say that the tool has become my most-used SEO tool in a little under 7 months. From their keyword database (and competitor insights) to their link database, AHREFs has become the place I go to get a first look at a site and then to dive deeper into the site and its rankings, links, and more. Highly recommended. It’s more expensive than SEMrush, but it’s a great tool. I also use a smattering of Chrome extensions that make life easier because they are directly in my Chrome browser and allow for quick analysis, which often leads to using one of the above tools to go deeper. For a long time I used Ayima’s redirect checker, but I began to experience some issues from it as it was not being kept us. So I switched over in early 2017 to the Link Research Tools Redirect Trace extension and have not looked back. This extension tells you the redirect hops that are taking place when you go to a URL, which has proven useful for both SEO audits and identifying rogue affiliates. 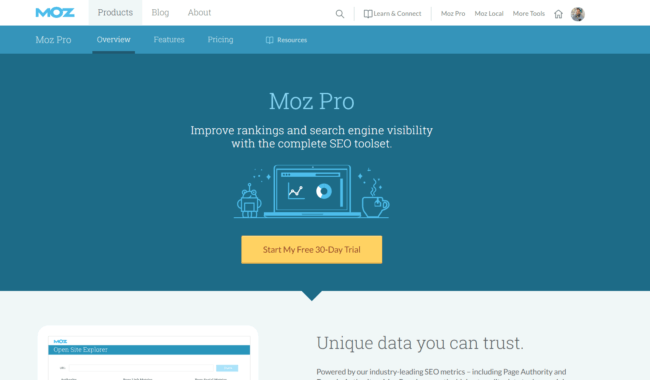 Moz’s MozBar is another tried and true tool that I have used for years. While I usually just leave it on DA mode in the top right of my screen, it can also be great for analyzing a specific SERP or while link prospecting. This extension is more useful for link outreach than anything technical for SEO, but it is worth a mention here (and is top of our how to find someone’s email address post). Basically, Hunter has a huge database of email addresses associated with domains and they provide a free as well as a paid tier. Using Hunter I have been able to find everyone from a small mommy blogger to a Fortune 500 CEO. The User Agent Switcher is simple – it lets you spoof your User Agent as Googlebot/Bingbot or even Safari, Kindle, or any of the web browsers. This is especially useful when looking for cloaking or what Googlebot/Bingbot are actually able to see on your page. This one hearkens back to my link builder days, but LinkClump allows you to click and drag your cursor over a set of links, either opening them in new tabs or saving them to your clipboard to then paste into Excel. It’s great for copying lists to prospect or opening big lists in tabs to manually vet. It’s simple, but oh so useful. What SEO tools should I have mentioned? The main one that I have not yet incorporated into my workflow is Ryte, but I’ll save that for another post. Curious where you think Ahrefs would fit into this mix? It’s been my favorite tool so far, but I’m curious why you don’t have it listed, even as an honorable mention. It’s a great question, Austin, and thanks for dropping by to comment! To be completely candid, I have never found a use case that Ahrefs does better than Majestic. I’ve been using Majestic for years and been very happy with it, so the switching cost for me is high and until Majestic severely goes downhill, I don’t see myself switching. What do you like about Ahrefs? Ahref’s interface is pretty clean and I would say it overlaps more with a RavenTools or Moz more than Majestic. Ahref is also great at finding the most popular content around a certain subject. This is more about meeting the daily grind in terms of getting that blog post out than necessarily having the most well researched list ever. At some point you got to call it good and hit publish. Let me also say, this is endemic of the issue of just telling all the tools. I use these because I work on enterprise marketplaces and do a lot of quick one-off auditing. I use them because they work for my workflow. For yours, Ahrefs or Moz or Raven might be better. To each their own and your mileage may vary. You use it instead of Majestic/Moz/Semrush, or alongside? Genuinely curious what I’m missing. Good round up John. Personally, I’ve ditched Moz and Majestic and just use Ahrefs now. The new interface, along with their keyword data has also caused me to cancel SEMrush. Also, their link alerts are scary fast. They have so much data and they collect it super fast. Wow, that’s some high praise right there for Ahrefs! I wouldn’t go as far to say that I’d ditch SEMrush for Ahrefs, but I love having both. Ahrefs has a really robust keyword ranking database, even though it’s more known for link research and analysis. There’s been numerous occasions where Ahrefs shows more ranking keywords for a site than SEMrush or Datacube (BrightEdge). Great post, btw. There are too many lists that try to include all of the tools and not enough that show a prioritized list that the author personally uses regularly. Depending on the website, either Majestic or Ahrefs have more backlink data. Ahrefs is MUCH more user friendly and has a lot of great features. Majestic, in my opinion, has more reliable metrics, but it’s a really “rough” tool, and using it is frustrating. Moz is the weakest tool – both when it comes to the backlink data or DA, which is a terrible metric to go by. I only to use Moz to easily download search results. I’d been using Ahrefs for a long time but they recently jacked up prices for no particular reason. That’s blatant rip off! I’ve switched to SEMrush which is enough on top of SERPStat’s second cheapest plan that includes API. Same results for better price. My favortite SEO tool is SEMrush. It is an incredibly powerful tool, very useful for Keywords. Great to see your SEO stack! Gun to the head, if I could only pick one tool – it would be Ahrefs for sure: backlink checker, rank tracker, keyword research tool, and Buzzsumo replacement all in one. At the same time, Screaming Frog is irreplaceable for crawling sites and connecting with Search Console and Analytics. Also – Moz’s new Keyword Explorer is pretty badass with capabilities not seen in other tools so I’ll be keeping an eye on that one. Interesting, thanks for that insight Joe! Mine right now would be SEMrush, but I’m seeing Ahrefs merits another look for me since so many love it. 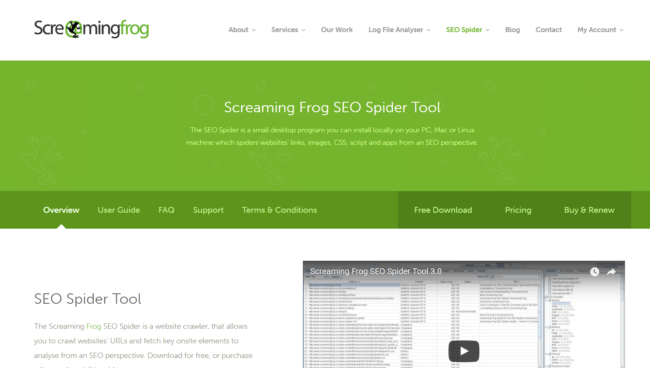 >> Screaming Frog is irreplaceable for crawling sites and connecting with Search Console and Analytics. Joe, dare to be accused of shameless advertising (wihch is only half-true, because I now I’m right ;)), but recent versions of WebSite Auditor ( http://www.link-assistant.com/website-auditor/ ) beats Screaming Frog in speed, number of pages it can crawl and provides a way more data (of course GA data and the rest is also available). Nice collection. Find more useful tools for the purpose of SEO at http://betapage.co/ simply browse through various tools that best matches your requirement. Thanks for sharing your SEO toolset, Joe! Mine is very similar to yours, but I have replaced Moz 100% with SEMrush. Beyond that, the only other tool I did;t see you mention was Google’s Search Console. Has anyone found good value in using services such as Agency Analytics, Megalytics, Quill Engage, or SEO Powersuite to assist in client keyword monitoring and reporting? I definitely can’t go without Moz, Screaming Frog or SEMrush. Now that I’m getting into more content dev and promotion, Buzzsumo has been very helpful with finding popular topics and social shares (not so much the outreach and influencer identification). I’ve just started a trial account with Ninja Outreach though to provide more of that influencer research and outreach. It seems pretty cool for the price compared to what I’ve seen with tools like Buzzstream and Tapinfluence. You forgot to mention SEO Powersuite. Probably the best tool out there right now with cloud based proxy support. Max – never heard of it, so thanks! Potentially one for people to look at. What do you use it for? I have landed here from inbound.org and feel good that I have read a helpful post this morning. I have been blogging since 2013 in WordPress CMS and hence I would say that the SEO is an art. Search engine algorithms are often changing and thus we need to play a smart game to please the search engines. I aware of most of the SEO tools listed here and yes, I use SEMRush, Long Tail Pro Platinum, and ahrefs. 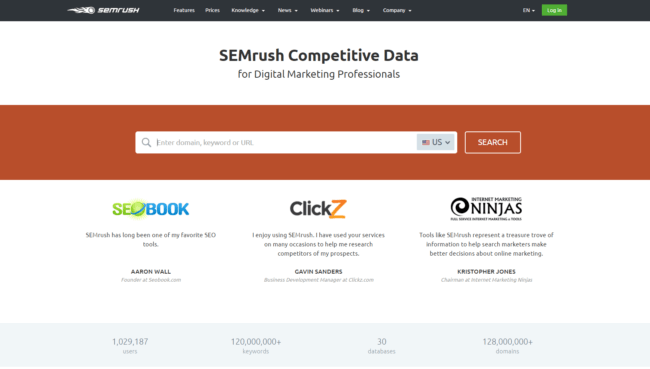 They are just amazing to do keyword research and competitor analysis. Moz toolbar is awesome, I have it already. However, I unaware of very few tools and chrome extension which you have mentioned, I’ll check it details. Thanks for crafting a good post for the bloggers and internet marketers, have a good day, today! Very useful tools from seo perspective this are the most used in terms of their insights, graphs, numbers, real-time data I my self prefer to use semrush and moz which are my favorite tools till date, thanks for sharing. Great article John! But what about SEOquake? An extension for Chrome and Firefox that can give you simple analysis of the website on the go. Hi Faisal! I didn’t mention it because I haven’t actively used SEOquake in years, though I know a lot of people still do! I get my needed date from the MozBar and other places. As for the Ahrefs vs. Majestic discussion, even though this post (http://www.matthewwoodward.co.uk/experiments/ahrefs-majestic-seo-1-million-domain-showdown/) is old it may give some interesting insights. AFAIK, the Ahrefs index is generally bigger and fresher than Majestic’s. Thanks for the link, Steven! To be honest, I have no idea what you mean by a “content point of view”. It’s my site, so shouldn’t I know what is on there? Might be different for community-driven content sites though. > It’s my site, so shouldn’t I know what is on there? Ideally, yes but if it’s not your website (e.g. your client’s) it becomes increasingly important. Indeed, also especially for community-driven sites, or eCommerce sites it’s really hard to keep track of all your content (Title, Meta Descriptions, Headings, Meta Robots, Canonicals, OpenGraph, TwitterCards, links) and its changes (we keep track of all of it). A lot of tools offer a weekly report of your website’s current state, but we believe that’s something that should be done continuously, with a changelog of what happened. For a quick SEO audit for a prospect when I’m selling them SEO services, I go to http://seorch.eu . They even will embed a white label version on your website so visitors can check their own sites from your website for under $100 per month. I think you should include more SEO tools and also there are numerous extensions that are really very helpful. I use all those tools and extension when I person SEO, SEM, Social Media & blogging online. Let me know if anyone needs my help in any way! Ozair – I think you are slightly missing the point of only listing the tools that I actually use daily. There are many “sometimes” and “every now and then” tools, but they’re very specific and other sites have covered them very well! Have you ever tried our (SEO&UX Tool) Forecheck at forecheck.com? Hi Ferhat, I have not. Honestly, I don’t really trust the site because you say it checks SEO and UX, yet your site is very hard to use! What tools would you all recommend for a new agency with a really tight budget? What would the addition of tools look like over time as money for this type of expense becomes available? Dan, I assume you are talking about an SEO agency. I’d say that you should have access to a good link auditing tool and rank tracker at minimum. Other than that it depends on your needs. I’d personally, if I could just have one tool, would use SEMrush and pay the $70 for it. Also, if you build it into your contracts and amortize it across clients, you end up getting it really cheap for your business. Full service agency actually. I get the “building it into my contracts” concept but at the early stages you need every spare dollar you get your hands on. Really surprised that Buzzsumo, BuzzStream, Ahrefs, and URL Profiler didn’t make this list. I see that a few other people have already chimed in about Ahrefs, but I’m most curious about how you do link outreach without a tool like Pitchbox or BuzzStream. Do you just use canned responses in Gmail? Simple – I don’t do manual outreach for clients :-). All my work is on the auditing/strategy side. But for outreach, you are absolutely right that those are great tools! This is a great list, John. It’s basically the same stack I use every day. IMO, SEMRush is a necessity and meets a lot of my needs (I wish their backlink abilities were better). Plus, for what it does… it’s priced nicely. Plus, the fact they are always trying to tweak and make it better is obvious and good to see. Only other thing I’d maybe add, if anyone does a ton of Local SEO is BrightLocal. The ability to scale and monitor multiple locations in multiple cities with a baked in Citation managing service is legit. For Chrome Extensions, I like LinkMiner (Jon Cooper’s tool). It’s nice for in browser link analysis when I’m wanting to look at something fast, plus you can run it in SERPs and look for cached 404s (which is also legit). No analytics tools on the list? I spend about as much time in analytics tools as I do SEO tools, I couldn’t see doing my job well without them. Very nice writeup and informative share first of all i would like to say a big thanks. Well what about keyword research tool as we knwo that 70% SEO is keyword research what you say about that ? Muhammad – great question and thanks for stopping through. I did mention SEMrush, which I use at length for keyword research, as well as Moz Explorer which I also use for it. What do you use? never mind but your article was nice. Thanks for this great post! Always good to see what others are using for their particular needs. I was happy to see a number of the tools I use are on your list. Great to learn about other tools I wasn’t familiar with before.